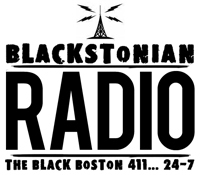 A recent study ‘The Color of Wealth in Boston‘ by the Federal Reserve Bank of Boston reveals staggering disparities between the amount of wealth held by white families in Boston and families of color. By nearly every measure, white households in Greater Boston had more wealth than African-Americans, Caribbean blacks, Cape Verdeans, Puerto Ricans, and Dominicans, painting a worrisome picture of a region with “staggeringly divergent” levels of wealth by race. 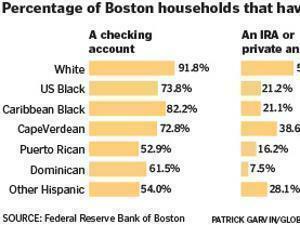 For example, about half the white households in Boston have private retirement accounts, compared to just 8 percent among the metropolitan area’s Dominicans. 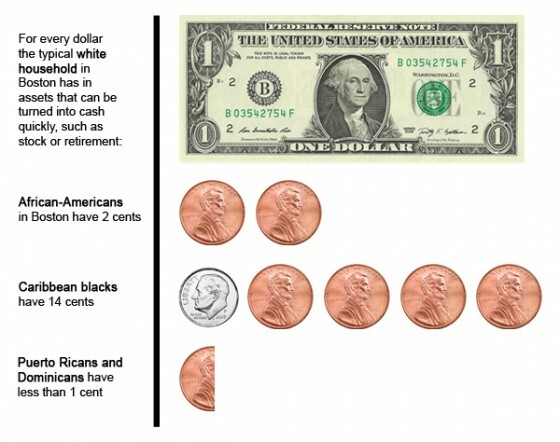 And for every dollar the typical white household has in assets that can be turned into cash quickly, such as stock or retirements savings, African-Americans in Boston have 2 cents, Caribbean blacks 14 cents, and Puerto Ricans and Dominicans less than 1 cent. This divide, Fed researchers said, is perhaps more troubling than the income gap because its effects can last for generations. The report found that the median white household in Greater Boston has $256,500 in net assets, such as retirement savings, stock, or a checking account, while none of minority groups studied had net assets over $18,000. Nearly half of all Puerto Ricans do not have bank accounts, and a quarter of blacks do not, according to the study. About 93 percent of whites have a savings or checking account or both. Few studies, including the US Census, survey people at this level of financial detail, Munoz said, although the results were not necessarily surprising. High unemployment, debt from college degrees that do not lead to gainful employment, fast-rising rents in the city — or any combination of those barriers — have hurt people’s ability to save, or even make ends meet, Blanco said. The Fed’s report was based on an in-depth survey administered to 403 households in the Boston metro area. Similar surveys were conducted in Los Angeles, Miami, Tulsa, and Washington metropolitan areas to gauge the wealth of various racial and ethnic populations. 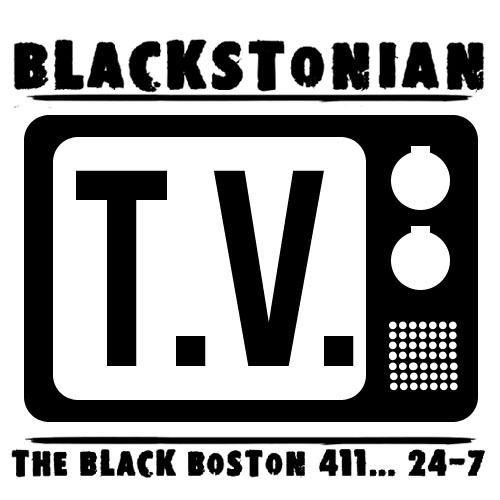 Among other findings, the report found that 79 percent of white Boston households owned a home, compared to half of Caribbean black households, one-third of African-American households, and around a fifth of Dominican and Puerto Rican households. Among homeowners, white households were the least likely to have mortgage debt. Juan P. Bonilla, deputy director of Lawrence CommunityWorks Inc., a nonprofit housing and community development organization, said new data from the report illustrates the challenges that households of color face in climbing the economic ladder. Bonilla said one Latino client arrived at the agency with a backpack containing $50,000 cash, his lifelong savings. He felt it was the safest place for his money. “For many Central Americans, South Americans, there is a distrust in the banking system because in many of those countries the banking system is unstable,” Bonilla said. A report released earlier this month by Brandeis University researchers found similar gaps in wealth between white households and those of Latinos and blacks families in the United States. For example, less than half of black and Latino households own their homes, compared to 73 percent of whites. People of color also get less of a return on their home ownership investment, the Brandeis study found. For every $1 in wealth that black homeowners accrue as a result of owning a home, white households get $1.34. For every $1 Latinos gain, whites get $1.54. According to the Boston Fed report, the populations facing the biggest challenges accumulating assets are also growing faster than the white population. That means more people with few assets, and unless something changes, the gulf between haves and have-nots will only widen. Percent of members of each group in the Boston area that hold certain assets. Percent of members of each group in the Boston area that hold certain debts.